At least 29 people were killed on Monday after a camp for displaced Yemenis was allegedly hit by an air strike. Here is what we do and don’t know. The intended target of the attack is as yet unknown. It is also not known who carried out the strike. There was speculation that it was the work of the Saudi-led coalition, but Yemen's foreign minister has blamed Houthi fighters. Around 500 families had fled to Mazraq camp in recent days, the majority from Saadah, Marco said. Their team had arrived the day beforehand to aid those fleeing the bombing. Nicoletta Giordano, Yemen Chief of Mission for IOM, said that a medical facility in the camp and the camp management building were hit in the attack. Issa said he was not aware of any military targets in the area. "They [the Saudis] are trying to scare us. The people here are terrified." Giordano said all humanitarian bodies were racing to the aid of those injured. “The entire community has rushed to help, including us who do not normally deal with IDPs [internally displaced people],” she said. IOM runs two medical clinics in Haradh, about 40 kilometres from the camp. Marco said he was unsure if the hospital had enough capacity to aid all those in need if attacks continue and more wounded arrive in the coming days. "We are preparing an additional team to go to Haradh," he said. He added MSF is seeking to bring non-food supplies to Haradh in order to support the displaced in the area. The camp was set up in 2009 during the wars between the Houthis and the former President Ali Abdullah Saleh's army. The majority fled from Saada and other predominantly Houthi areas. The residents live in conditions of dire poverty in incredibly tough conditions. There were originally three camps at Mazraq, set up to receive Saada IDPs in 2009. The UAE’s Red Crescent organisation used to run Mazraq II but handed over the site to local partners in 2011. The UAE, along with other Gulf countries, is backing the Saudi-led bombing campaign in Yemen. 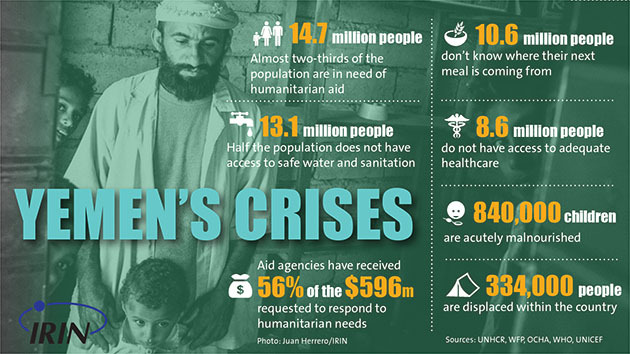 According to UNHCR, there are around 103,014 IDPs in the Saada region - accounting for one third of all IDPs in Yemen. Saleh has since joined forces with the Houthis against his successor Abdu Rabu Mansour Hadi, who was placed under house arrest in September when the Houthis took control of the capital Sana’a. Hadi has since escaped and has fled the country, but is supportive of the Saudi strikes. To learn more about the 2009 conflict, see IRIN’s special report.